Have I inherited my parents' insomnia? was awake at 3 am, unable to fall asleep. Cora awoke at 4; I nursed her. It started to get light at 5, at which point I threw in the towel and made coffee. It dawned on me that I could go running alone, so I ran 6 miles at 5:30 am. Yes, it was very weird to go jogging sans 80 pound jog stroller and kids! After I showered at 6:30, the kids were still asleep. I played guitar until Cora woke up at 8:15. I nursed her and sang to her and waited for Jack to wake up: 9 am. Jack's buddy, Rafe, arrived at 10 am, just in time for the storms to come raging through East Nash. I'd asked Rafe's mom to pack a swimsuit so we could do the Slip n' Slide. Woops. Instead, the kids ran around in the rain and under our carport with the big wheels; and soon the torrential downpour had filled up Jack's toddler pool. 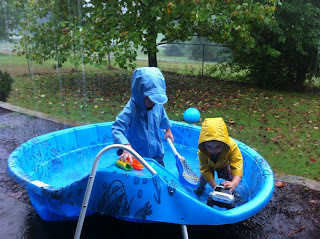 The kids jumped in it, clothes and all, as the rain poured down. It was quite a sight. They would tramp around in the mud, hop in the pool, hop back into the mud, pool, mud, pool. I stripped the kids down and told them both to go pee pee in the yard. They both walked over to the pool and peed in it. I instructed both kids to hop in the tub. I de-muddified their little bodies while they went nuts in the tub together. 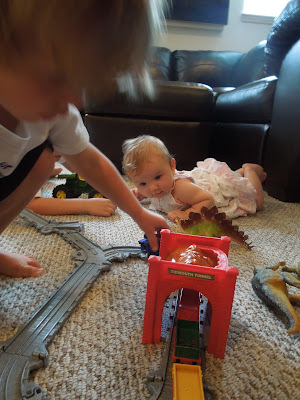 I dressed them in clean clothes and took them to the playroom, where I'd set up Jack's train tracks for them. Cora crawled around and looked interested in their doings. Then the kids headed upstairs for snack and juice while I made their PB&J's. Rafe's mom had told me, "He doesn't like jelly. Give him only peanut butter on bread." I said to Rafe, "Just peanut butter, right? No jelly?" He said, "NO! Only jelly. No peanut butter." I texted Rafe's mom. She said, "Don't trust him!" After lunch, Rafe's mom, Tessa, came to pick up her son. She said, "No one would understand unless they had little kids. Nothing else breaks you like this. Nothing!" Earlier, I'd told her about my weird morning, jogging at 5 am. She said that she knows other moms in show business, and that some of them manage to sleep until noon (their husbands do the early morning shift, I guess). She asked how I managed to be a musician and still raise two tiny children. I said, "I had to change my lifestyle. And it was not without a fight!" We're talking about my old life: I'd play a gig, wind down, and go to bed at 2 am or so (or drive in the van til 3 am and crash in a hotel). I never thought I'd be an early riser. I can't fight with a child's sleep schedule. There's just no point. Children wake up at 6 or 7 am, and they need an early bedtime. Thank goodness for the invention of monitors!